I really love this time of year. In the third week of November, I usually start to feel a magical buzz in the air, which always seems to have a crescendoing effect up to Thanksgiving. Thanksgiving is my favorite holiday. I love that it is a holiday that is not materialistic or greedy, but one that simply brings family and friends together for a meal. Thanksgiving, historically, was a harvest meal celebrating the cooperation between the English settlers and Native Americans in 1621 in which thanks was given to the successful bounty of crops. I really love Thanksgiving’s symbolism and while most Americans are not literally giving thanks to a successful crop season each year, our Thanksgivings – or at least mine – truly does symbolize a harvest meal. The anticipation and preparation of Thanksgiving is almost has much fun as eating the meal itself. This year, while I am not hosting Thanksgiving or preparing the turkey, I am making a few side dishes. I am very excited for my role this year, mostly because I feel like I have graduated from sous-chef or kitchen helper to “chef contributor.” I take my role seriously and have well-researched the types of dishes I want to prepare, focusing mainly on recipes that can be made from fresh and local ingredients. After deciding on a brussel sprouts dish and perhaps a cauliflower gratin of some sort, I made my way to the Alhambra farmers’ market. Alhambra, a town nestled between San Marino, South Pasadena and San Gabriel, offers a farmers’ market every Sunday that is a real treasure trove of fruit and legume wonders. Although I was at the farmers’ market to buy just the few items I needed for my Thanksgiving side dishes, the spirit of the the harvest got me a little produce-happy. Quickly forgetting that it is a short week due to the holiday, and that we are traveling this weekend, I bought enough fruits and vegetables to last us two weeks. Armed with fresh plums, pears, and blackberries, a few varieties of basil, four pounds of brussel sprouts, a head of cauliflower the size of a garbage can lid, a few pounds of string beans, heirloom tomatoes, baby zucchini, and the list goes on…I left the farmers market feeling the need to give thanks to my bounty of crops. While I think George is slightly skeptical of the farm that is now residing in our refrigerator, I have devised a culinary plan in which George and I will honor Thanksgiving’s symbolism by having a harvest meal every night this week. And our meal last night did just that. Using the fresh blackberries, I made a blackberry-red wine reduction and served the sauce over sauteed pork chops. This recipe idea, while admittedly novel, is not one that I would recommend. The reduction was bitter and almost a bit acidic, and even though the ingredients seemed so benign, (shallots, wine, chicken broth, blackberry puree and salt and pepper), the sauce did not come together as I hoped. Fortunately, the rest of our dinner did and we enjoyed perfectly roasted potatoes and carrots and a fresh salad that incorporated the heirloom tomatoes I had bought earlier in the day. And for dessert, well that just took the cake…or tart! A Beautiful and Tasty Plum Tart! 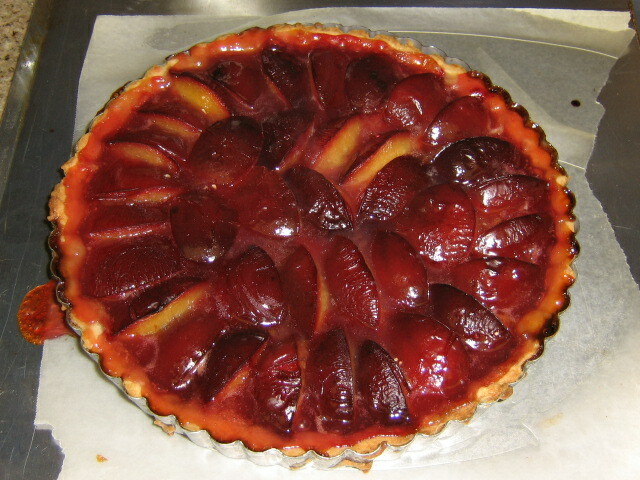 Check out this plum tart! Not only did it actually look beautiful, but it was a simple recipe that accentuated the flavors of the fresh plums. The filling was simply quartered plums placed symmetrically around the tart shell with a sugar, cornstarch, vanilla and lemon juice batter poured over the plums. The tart was so tasty and thankfully off-setted my blackberry reduction debacle. Our Sunday night dinner may have made a dent in our produce-laden refrigerator, but it also jump-started this important holiday week. While George and I will have another harvest meal tonight, The Alhambra Farmers’ Market – and the local produce Southern California has to offer – certainly puts the meaning of Thanksgiving into perspective this year. 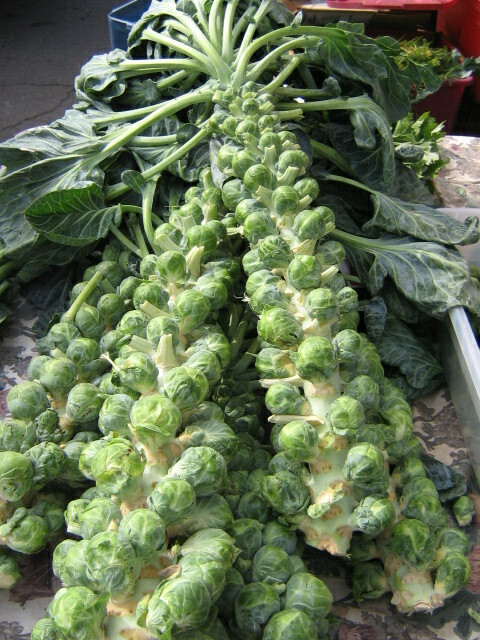 This entry was posted on November 24, 2008 at 11:06 pm and is filed under California Produce, Farmers' Markets. You can follow any responses to this entry through the RSS 2.0 feed. You can leave a response, or trackback from your own site. Could you please give me your recipe for plum tart? My partner is addicted to it, and I still have not yet got a recipe for it. Thanks, Nikki. Can you tell me is the pastry a sweet pastry with an egg or with out? And did you bake the pastry shell blind first (and if so at what Gas Mark/Temp)? If you did not make blind, did you add the cornflour glaze before or after cooking the plums…ie. did you bake the shell blind, or did you bake with the plums on top (but no glaze) or with the plums and a glaze?